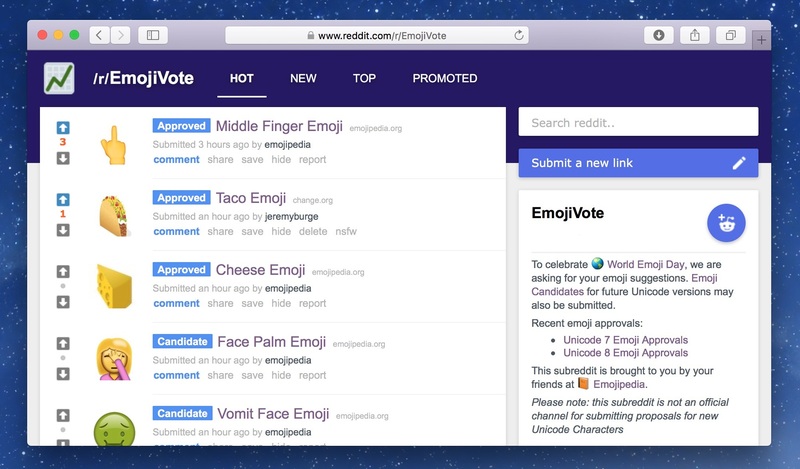 Your emoji suggestions now have a home on the web. To celebrate World Emoji Day, we have created EmojiVote. This is a subreddit moderated by Emojipedia, for the sole purpose of measuring interest in new emoji suggestions from the public. When pondering which ideas to submit, you may notice updated example images for some of the Unicode 9 emoji candidates on Emojipedia. Our first four creations are shown below, as a demonstration of how the final emoji artwork could look if these are approved next year. Look out for more example images in future, as we provide a glimpse at how the new candidate emojis could look. And finally, please be aware that EmojiVote is not an official channel for submitting proposals for new Unicode Characters. Instead, this is a way for the public to make their feelings known about which new emojis they want to see, in the simplest way possible. Happy World Emoji Day everyone, and let the voting begin!